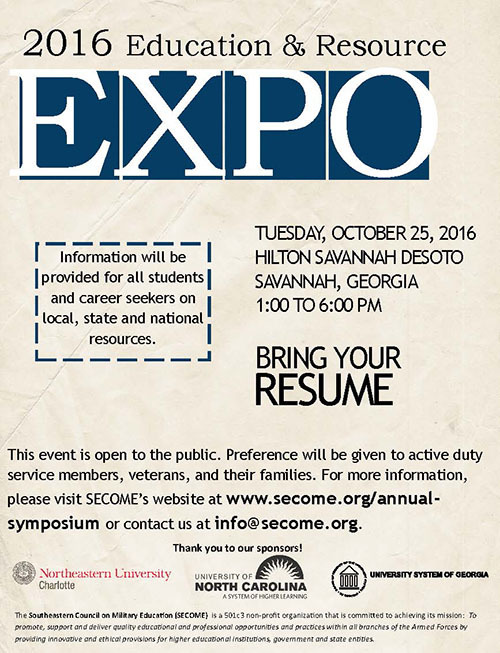 On Tuesday, Oct. 25, 2016, the Southeastern Council on Military Education (SECOME) will host an annual symposium that will include an Education and Resource Expo for military-affiliated personnel and area residents at the Hilton Savannah DeSoto from 1-6 p.m.
At this free event, area residents as well as military-affiliated personnel will learn about local, state and national resources and opportunities to better assist with higher educational and career transitions. Representatives from colleges and universities, and other organizations and corporations will be onsite to discuss all types of educational, career, and advancement opportunities as well as provide support services to assist military-affiliated personnel transition into civilian life. In addition to the expo, SECOME will host a two-day conference which is expected to attract over 120 attendees. The 2016 SECOME Symposium will be a great opportunity for professionals to meet with military-affiliated students, Department of Defense and Department of Veterans Affairs representatives, as well as other nationally-known stakeholders within military education. Agenda items include an ESO panel, student services panel, guest speakers regarding military transition, local and national support resources, and a keynote address by David Chrisinger, author and communication and veteran transition specialist.